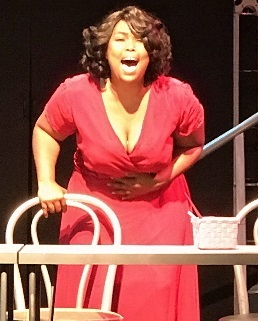 Sarah Gracel as Effie White in Dreamgirls. Broward Stage Door is rapidly becoming a theater company to reckon with. Over the years, its resources and artistic output have been nothing if not erratic, but the Coral Springs troupe keeps setting the bar higher, announcing its intention to do complex shows that seem way over its head and then flooring us with its achievement. Earlier this year, it mounted a miraculous production of Maury Yeston’s Nine, and now the other shoe has dropped. Currently playing through Dec. 10 is the show that competed with Nine for the 1982 Tony Awards, Dreamgirls, Henry Krieger and Tom Eyen’s pulsating look at the seamy side of the recording industry as well as the contentious evolution of the 1960s Motown sound and a girl group that is suspiciously reminiscent of The Supremes. To work, the show needs a large cast of multi-talented performers – particularly in three key roles – and boy, has director Kevin Black got them. The standout in any successful rendering of the show has to be the actress playing Effie White, the soulful vocalist who simply cannot fit in, either with her overpowering voice or her hefty profile. The Stage Door has imported from Miami the larger-than-life – in the most positive ways – Sarah Gracel. Also crucial to the Dreams’ success and the success of any Dreamgirls production is the character of Curtis Taylor Jr., the manipulative manager of the group. Don Seward is a velvety viper in the role, crooning his affection for the Diana Ross character (“When I First Saw You”), but never doubt that the character – sort of based on Berry Gordy – is only out for himself. The third juicy role is soulful rocker James Thunder Early, a fictional version of James Brown, who initially takes on the Dreams as his backup singers, but is soon eclipsed by them as his career self-destructs. As the character name suggests, the part is thunderous, an apt adjective for Elijah Word. He preens and struts across the stage, a craftily calculated out-of-control performance, which is anything but. The Dreams, in a scene from Dreamgirls. With those three roles in assured hands, the Broward Stage production is already well into the winner’s circle, but director Black has scoured the area and found the additional talents he needs to fill out an impressive ensemble. And choreographer Danny Durr puts them through the signature moves of the 1960s Motown groups, which go a long way to cement the evening’s authenticity. The original Broadway production was built around a bare stage and a series of mobile towers which went through their own computerized choreography. That is beyond Stage Door’s technical skill and budget, so it went in a curious, different direction with a set dominated by a pair of curved staircases. Whatever designer Ardean Landhuis had in mind with them, they are barely used by Black. Jerry Sturdefant’s many costumes invoke the period well and solve the occasional need for blink-of-an-eye changes. 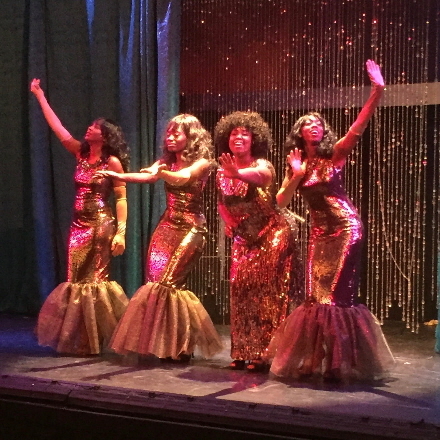 Dreamgirls demonstrates what this theater can do when it is firing on all cylinders. Miss it at your own peril. DREAMGIRLS, Stage Door Theatre, 8036 W. Sample Road, Margate. Through Sunday, Dec. 10. $48. 954-344-7765.